Once again, the #8/6 Terriers made their coaches and fans sweat, fashioning another comeback win from an early two-goal deficit to defeat Northeastern, 3-2 on a Chad Krys goal. With the win, BU sweeps the Hockey East quarterfinal series at Agganis Arena and moves to the conference tournament semifinals for the 13th time in the past 16 seasons. The Terriers’ next opponent will be either BC, who swept Vermont, or New Hampshire, who plays a deciding game three today against Lowell. Mimicking Friday night’s script, the Huskies came out fast and established an early territorial advantage. Strong forechecking kept BU bottled up in its own end, leading to Biagio Lerario’s first collegiate goal at just 2:23. NU doubled the lead midway through the period when Nolan Stevens redirected Matt Filipe’s entry pass, just three seconds after a power play had ended. 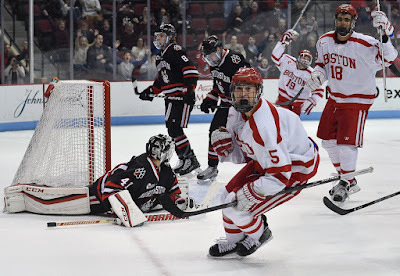 Northeastern threatened to make it 3-0 in the second period with eleven shots on goal, but once again freshman goalie Jake Oettinger slammed the door, making several 10-bell saves including one on a back-door play with the Huskies up a man. BU finally got on the board with just over five minutes left in the second period on a slick give-and-go-play that began with Charlie McAvoy dropping a pass to Jakob Forsbacka Karlsson skating through the neutral zone. JFK dished to Clayton Keller along the left side, then burst between two defenders and redirected Keller’s return pass over the stick of goalie Ryan Ruck. Northeastern’s 2-1 lead lasted just three minutes into the third period. JFK brought the puck into the Huskies’ zone and found Nick Roberto in the high slot. The senior wing held the puck as Jordan Greenway headed to the net and wired a shot past Ruck, again stick side. The teams appeared to be headed to overtime again when Garrett Cockerill (brother of BU recruit Logan Cockerill) hooked JFK as he moved toward the net from the right circle at 18:26. On the ensuing power play, McAvoy slid the puck to Krys above the left circle. He passed to JFK whose shot from along the goal line was saved by Ruck, but Krys was right there to bury the rebound with just 25 ticks left on the clock. ► With two power play goals on three opportunities, BU was 4-for-8 with man advantage in the series. By contrast, Northeastern, which had the second best power play in Division 1, was stymied on all seven opportunities, although Stevens’ goal came seconds after a man advantage ended. ► JFK, with a goal and two assists, was the game’s first star, while Krys was the second star. McAvoy assisted on all three BU goals and played a strong game on defense. 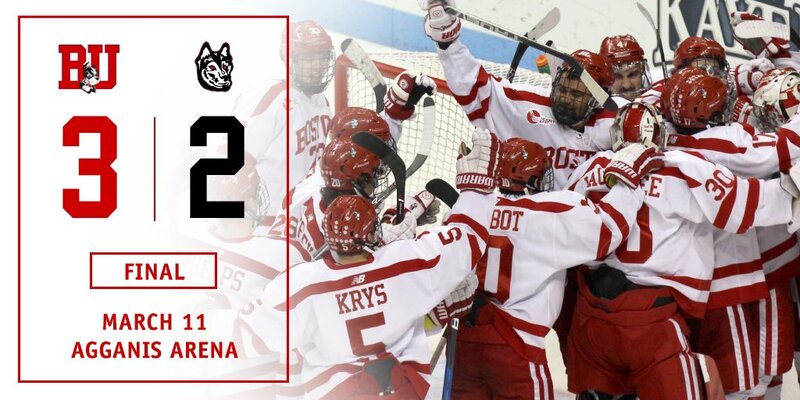 ► BU’s final game at Agganis Arena gave the team a 13-3-2 record on home ice. 2018 recruit Shane Bowers assisted on Waterloo’s first two goals en route to a 6-1 win against Sioux City. Bowers, who earned second star honors, has 44 points (19G, 25A) in 51 games. 2017 recruit Jake Wise scored his ninth goal in the NTDP U17s’ 7-3 loss to Lincoln. The former Central Catholic standout has 25 points for the U17s. Matt Nieto scored his fifth goal to give Colorado an early lead, but the Avs fell to Ottawa, 4-2. Alex Chiasson scored his ninth goal in Calgary’s 3-0 win against Winnipeg. He has 17 points this season. Danny O’Regan’s shootout goal gave the San Jose Barracuda a 2-1 win against Grand Rapids. O’Regan leads all AHL rookies with 49 points (18G, 31A). Matt Grzelcyk scored a goal and added an assist for Providence but the Bruins fell to Wilkes Barre/Scranton, 3-2. He has a 5-19-24 scoring line.